Since Chilli turned 7 recently, we’ve been doing a very gentle introduction to numbers in this final Kindergarten term. We’ve had so much fun with the Earthschooling ‘Sixth Sense Maths’ program – exploring the numbers in different ways through their Physical, Mental and Spiritual dimensions. 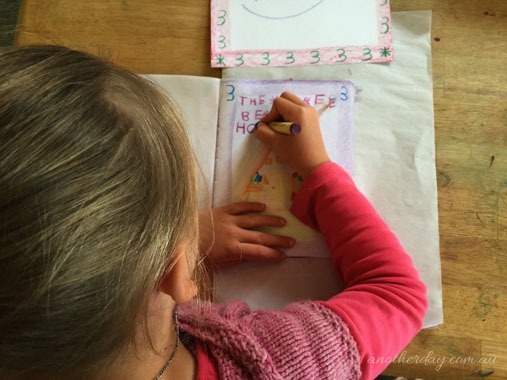 Once we’ve finished the numbers 1 – 10, I’ll try and find the time to photograph Chilli’s number book and do a post about how we explored each number. In the meantime, I wanted to put together this brief post to share our experiences with Learning the number Three this week. This year, Chilli just learnt the letters of her name, however since turning 7, she has been copying some very basic sentences from my writing, relating to her lessons. She is very excited about learning all her letters next year. 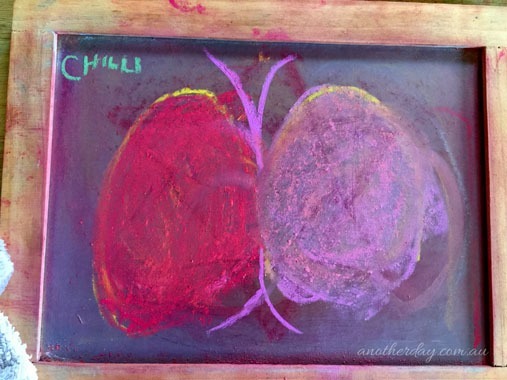 When I feel Chilli is ready to try writing the number, we first take our chalk boards to write the form a few times in a ‘semi-permanent’ way. I think this step is really important as it’s a gentle ‘easing into’ the written form for the child. I actually remember as a younger child, feeling a lot of pressure as I went to take pencil to paper learning to write. It’s a very permanent ‘no mistakes’ kind of medium. That’s definitely not to say I expect no mistakes of Chilli when she does take crayon to paper, but I think there’s a nice gentle ‘easing into it’ when the first written form is in a casual space. 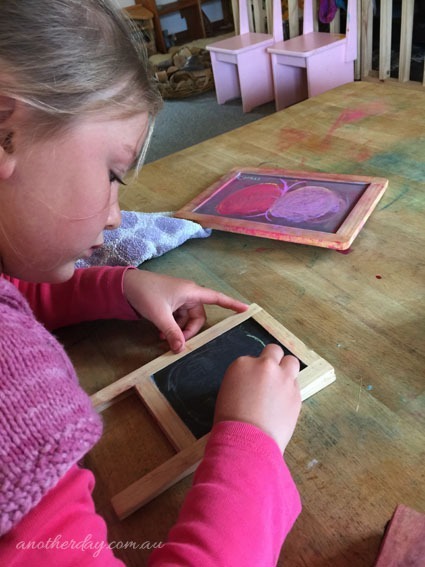 Whenever we come to the chalkboard or the paper, we always ‘practice’ first – in the air with our finger pencil and then on the board or paper with our finger pencil, before we put the chalk to the board or crayon to the paper. I think this step is also really important. The air practice re-inforces the form and the finger pencil practice on the platform before the medium meets it, helps to bring a spacial relationship between the form and the page. I’ve watched Chilli many times with her finger pencil get to the bottom of the platform only halfway through the letter or number and say “Oh, hang on”, starting again. I find 3-5 times of finding the form on the platform with the finger pencil really brings that spacial relationship nicely before actually writing the number or letter. When we are drawing the form on the chalkboard, we often will turn the number or letter form into a picture for fun. This week with the Number Three we have been discussing objects around us that have the word ‘tri’ in them – meaning ‘three’. The triangle we ring each day for start of school, the tripod Daddy uses for the camera occasionally and the trinity on Mummy’s wedding ring. It’s so empowering when children remember, realise and make connections with things mentally on their own. Chilli was excited to think about how the clover has three petals and remember the story about Saint Patrick plucking a clover from the grass to speak about the Holy Trinity. It’s said many times through Waldorf literature how important this early childhood foundation of story and verse is that we lay in those first seven years. Watching this all blossom, unfold and live so deeply in Chilli is really magical. I have a friend who often says to me how blessed we are to be the ones bringing this curriculum to our children – to not only share the experience with them, tailor a program that meets our child exactly where they are, but also to see the magic that lives in them and the connection, realisation and neural pathway spark just ‘light up’. What an immense blessing and phenomenal privilege homeschooling truly is. We also spoke about the three horned dinosaur – ‘triceratops’ and the name for three babies born at once – ‘triplets’. We haven’t done a lot of reading on dinosaurs as yet so Chilli found this concept of a three horned dinosaur really bizarre and surreal. The main reason I wanted to post here however was to share a really wonderful resource for Learning Three. 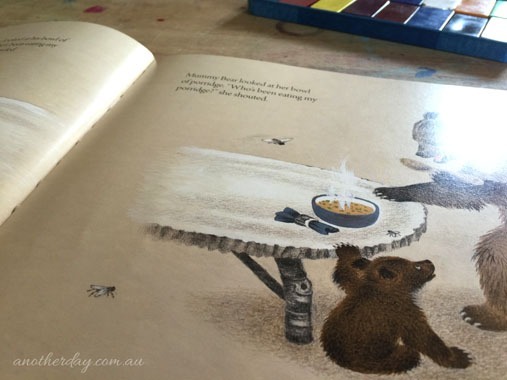 The Spiritual discussion on Three in our Earthschooling Curriculum mentions Goldilocks and The Three Bears. Today I asked Chilli if she could think of a Fairytale or Story she remembered that had something about the Number Three in it. 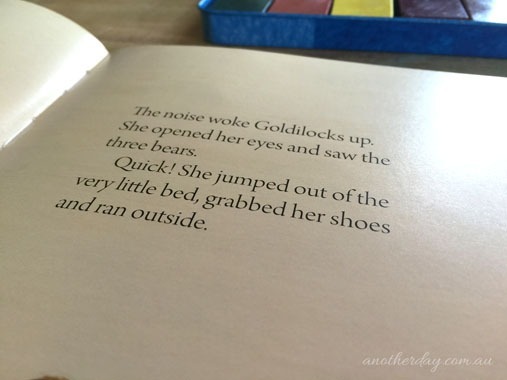 After a few moments of thinking, she said “Goldilocks and The Three Bears!” Again, that connection of story in the early years that makes concepts ‘Jump up and Live’ in the child. We sat together and read this book – I really love Gerda Muller’s works. Her stories are beautiful and her pictures just gorgeous – classic illustration at its best. 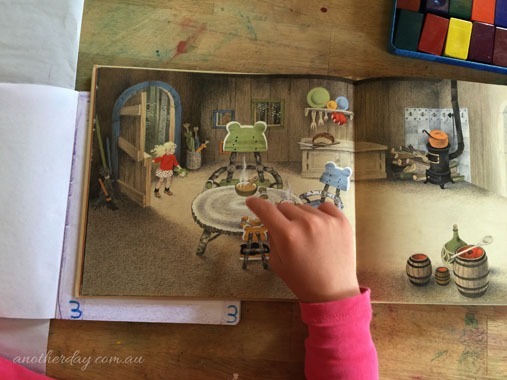 Now most often in Waldorf Lessons, we will tell a story through either puppet scenes or in a Grades Lesson, by bringing the story to life via illustration on the chalkboard. However what I LOVE about using this book for the Number Three is the thoughtfulness of Three throughout the book’s illustrations. Each page, after we read the story, we would count the things we could see in threes. And there is a bounty of items grouped in three through this book – it’s brilliant! Three tree trunks together, three branches coming out of a cluster together on the tree, three squirrels running up the trunk, three snails together on the ground, three butterflies flying around – and of course then once you’re inside the bear’s cottage there is a whole new world of three: bowls on the table, brooms in the kitchen, umbrellas by the door, chairs, beds, money boxes and dressing gowns. We had such fun counting all the threes in this book. 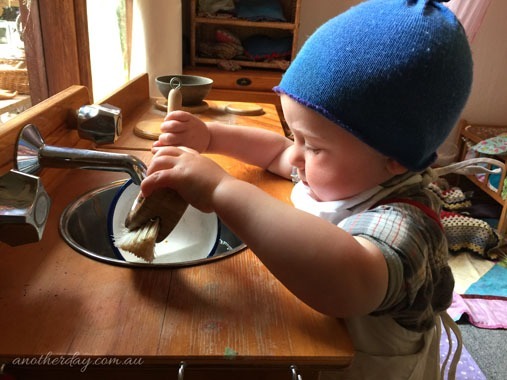 In essence, this is what Waldorf Education is all about for me – especially in these early years and elementary grades. Making the lesson really Live in the child and not having a concept that stands separate to them as a foreign ‘thing’ to be ‘learnt’. In bringing the lesson as an ‘experience’ so that the information lives within them, we make this knowledge a part of their being. Education should not be something that is separate to a child, it should be something that is integrated into every aspect of their being, something that has a life of it’s own that the child experiences rather than has to ‘learn’ as a foreign concept. This introduction to numbers 1 – 10 is very gentle and basic. We will of course be revising the numbers next year through a formal Grade 1 block and bringing together the number forms with a very gentle introduction to the matching Roman Numeral form as well as the written word for each number. We’re all wonderfully excited about the program we’ll be doing next year. Marlin is at a really beautiful age that harmonises wonderfully well with being able to bring deeper, more focussed lessons to Chilli. I’ve said many times that even if we’d sat down and mapped out ahead of time exactly when we’d have our children, considering their correlating ages along the way, we couldn’t have planned more perfectly the age Marlin would be as Chilli was starting the Grades. Today while we immersed ourselves in Three, he immersed himself (by our side) in his latest obsession. A little bowl of water in the sink of ‘Pumpkin House’ to tend to the daily washing up. I can’t even begin to count and tell you how many changes of clothes we’re going through on a daily basis at the moment. A hand wash bowl, a small cup of water, a sink if someone stands with him and allows him to indulge in that privilege or the hose if he is close by when the gardens are watered or a can is being filled. He’s definitely our water boy little Marlin! How is your planning for the coming school year going? I’ve just laid the foundation of blocks, rotation and concepts on how each lesson subject will be brought to Chilli. There’s still lots of work to be done, but it feels exciting to have that foundational direction laid. Hopefully I’ll have the time at some point to put together a little post about the planning I’ve been working on and the concepts we’ll be using for Grade 1 lessons.